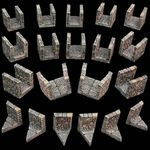 Game Tiles Narrow Dungeon Passage Pack is made of "Dwarvenite" and expands the Games Tiles Base Set. It was offered as an add-on pack during the Cavern Kickstarter. The pack comes in both painted and unpainted versions.